Uniquely enough, Chanda was meeting a coworker for lunch when they bumped into Cedric in the parking lot, her coworker introduced them and Cedric won her over with some funny jokes. They hit it off from there and dated for two and a half years before Cedric proposed. He asked on Christmas Eve, in an intimate setting in front of his two children. They landed on a destination wedding primarily because Chanda doesn’t like heavy planning. She thought the idea of a traditional wedding sounded tedious and time-consuming. Chanda dropped multiple hints in favor of a destination wedding until Cedric and her father were persuaded. The couple liked it because it sounded much more affordable, and with much less work involved. With their Destify agent Andrea, they chose Jamaica, an international location with an ideal beach setting. 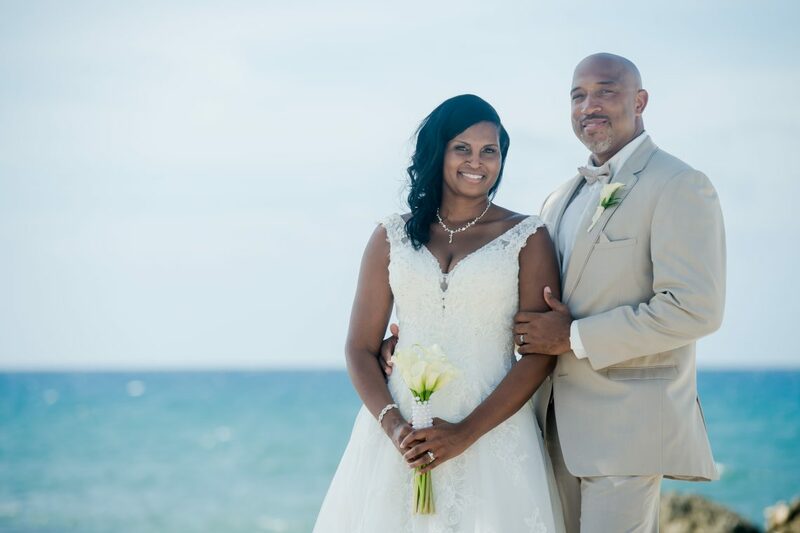 They landed on the Grand Palladium Jamaica, an elegant resort with tons of amenities. The couple ran into some technical problems during their ceremony. With spotty wi-fi they had trouble getting the music prepared for the ceremony. But the couple is happy with how the resort reacted, helping to resolve the issue. The couple joked that if you have a rehearsal ceremony to make sure you really go over every detail, including technical aspects. Cedric was especially appreciative of the pastor the resort provided, who really helped to make their vow exchange all the more memorable. The couple said there wasn’t a dry eye amongst guests. Chanda recommends looking into the local and resort vendor fees beforehand if possible, so you’ll know more about the pricing. The couple admits their package costs were more than expected due to the extra family members joining. They said the ceremony was their favorite part of the destination wedding and despite the technical issues they thought it was perfect. They also loved how much there was to do at the resort and said everyone had a great time they will remember. In fact, Chanda says the wedding is all Cedric and her father talk about now. There was something to do 24-hours a day constantly. We didn’t have to worry about entertaining our guests, they were busy entertaining themselves.